Small Grocers shops flourished and they could be found on every other street in cities. They were often quite small shops with produce stacked high inside and were usually family run businesses. 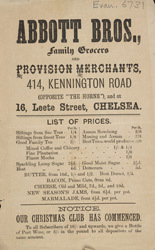 It was very important that the produce sold in these shops looked appealing to the customers to encourage them to buy the food stuffs, so paper packaging was colourful and fruit would have been brightly polished.